WELLINGTON • A large chunk of the southern flank of the volcanic Anak Krakatau island may have slipped into the ocean just minutes before a tsunami hit an Indonesian shore, killing hundreds of people, scientists said yesterday. At least 280 people were killed, hundreds injured and numerous buildings were heavily damaged when the tsunami struck, almost without warning, along the rim of the Sunda Strait, between Java and Sumatra islands, late on Saturday. The timing of the tsunami, over the Christmas season, brought back memories of the Indian Ocean tsunami triggered by an earthquake on Dec 26, 2004, which killed 226,000 people in 14 countries, including 168,000 in Indonesia. Scientists said yesterday that the consensus, based on satellite images and the information available, was that the collapse of a portion of the volcano triggered the killer waves. Images captured by the European Space Agency's Sentinel-1 satellite showed that a large portion on the southern flank of the volcano slid off into the ocean. "Underwater landslide is the leading theory," said seismologist Sam Taylor-Offord of GNS Science in Wellington. "So, when that land pushes into the ocean... it displaces the ocean surface, causing the vertical displacement that causes the tsunami," he said, adding however, that the lack of data and access made it impossible to confirm this theory. Anak Krakatau, halfway between Java and Sumatra, has been spewing ash and lava for months. It erupted about 24 minutes before the tsunami struck, and that could have triggered the landslide. Mr Taylor-Offord said the eruption and "high noise environment" may be why the landslide was not recorded seismically. The fact that the tsunami was triggered by a volcano, and not by an earthquake, may be the reason why no tsunami warning was signalled, scientists said. In Indonesia, we have all been waiting for another big earthquake tsunami, and then boom, here we have a volcanic landslide one... I have seen a few bits of imagery that suggest there is some sort of slant collapse that may extend underwater, but none of this will be confirmed until there can be an offshore survey where they go and map the sea floor. MR JOSE BORRERO, a coastal engineering expert specialising in tsunami hazards at eCoast Marine Consulting. Coastal residents reported not seeing or feeling any warning signs, such as an earthquake or receding water along the shore, before waves up to 3m high surged in. 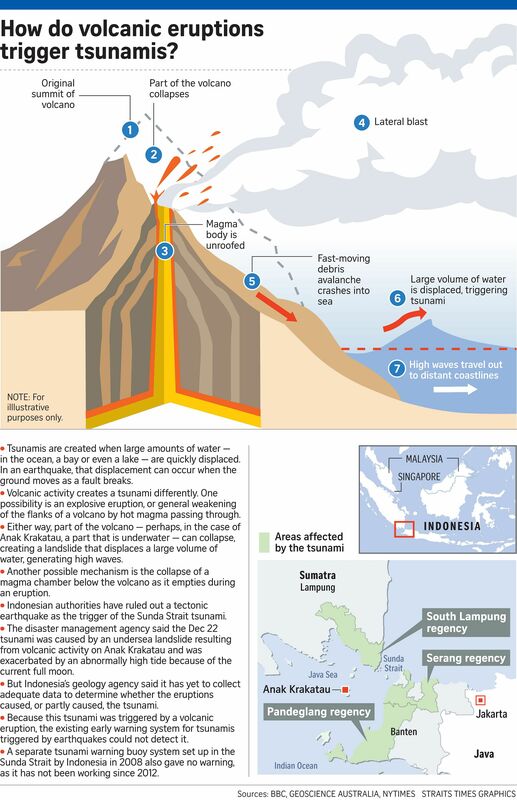 Mr Jose Borrero, a coastal engineering expert specialising in tsunami hazards at eCoast Marine Consulting, said that landslide-generated volcanic tsunamis behave idiosyncratically, compared with tsunamis generated by earthquakes, which are better studied. This is because there are so many different variables, and there is a "sweet spot" of exactly the right speed and volume of rocks slipping into the sea, and deeper, to gene-rate a wave. "In Indonesia, we have all been waiting for another big earthquake tsunami, and then boom, here we have a volcanic landslide one," said Mr Borrero. "I have seen a few bits of imagery that suggest there is some sort of slant collapse that may extend underwater, but none of this will be confirmed until there can be an offshore survey where they go and map the sea floor." Anak Krakatau, or "Child of Krakatau", emerged from the Krakatau volcano, which in the 1880s erupted with such force that the blast was heard all the way in Perth, said Ms Mika McKinnon, a geophysicist based in Vancouver, Canada. Further eruptions have continued from the massive crater left behind. Ms McKinnon said volcanoes are weak, sloppy heaps of loosely bound rocks all slanted downhill and they slip off all the time. If this happens to be a large portion, then it would displace enough water to trigger a tsunami. There are no early warning systems that can detect such landslide-driven tsunami. Anak Krakatau is so close to shore that there would never have been enough time to react and clear out the population. "It is hard to identify landslide-triggered tsunamis, especially quickly enough to issue useful warnings," said Ms McKinnon. "A similar event at Anak Krakatau might trigger another one, or it might not. Maybe a month later, or year from now. We will never know," she said. How do volcanic eruptions trigger tsunamis?